This baby bootie is adorned with satin ribbon tie and trimmed with heart sentiment Baby Steps with Jesus. White porcelain shoe with stitched trim design. 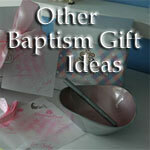 Perfect for baby boy or girl at christening, baptism, or dedication.